Combining the various modalities and learning styles while keeping in mind hemispheric brain preferences and gender differences into a comprehensive teaching environment ensures all students an equal opportunity to understand how to learn using personal learning styles. In addition it helps them to develop skills in areas other than their preferred learning methods. According to the government’s ERIC database such articles as Learning Styles: Implications for Improving Educational Practices reveal the myriad of ways students process information and how this can improve the learning process overall. There are three basic ways people assimilate information, and we each develop a preferred way of how to learn using personal learning styles when we are children. The younger the child, the more likely the child is to learn using all three of the common learning modes. As early as age 6, children begin to show a preference for one primary mode of learning and a secondary mode. By incorporating all three learning styles in a teaching environment, you can be certain all of your students will become life-long learners by knowing how to learn using personal learning styles. The first learning style is known as visual. Visual learners understand how to learn with their eyes. They like photos, videos, demonstrations and diagrams. Visual learners are usually organized and prefer quiet surroundings so they can notice detail and absorb the visual information. The second learning style is auditory. Auditory learners understand how to learn by hearing and talking about new information. They need to be able to listen and speak out loud about what they are learning. They often prefer to learn with music playing and can be a bit noisy as they work. Auditory learners are also great story tellers. The third learning style is tactile or kinesthetic, and these learners understand how to learn as they prefer hands-on activities and learning through motion. They may twirl their pencils, fidget in place, or tap a foot. The must move in order to understand how to learn. Their habits and environments are often cluttered and they love to try new things. The way kinesthetic learners know how to learn often tend to be highly artistic and prefer manipulative learning resources. Project-based learning works well for them. Learning experts say that teaching a student how to learn using personal learning styles rather than just telling them what to learn will impact their ability to succeed in school and in life. Take the free Personal Learning Styles Quiz on the home page at HowToLearn.com to find out your how to learn style preference and if you are a visual, auditory or kinesthetic learner. 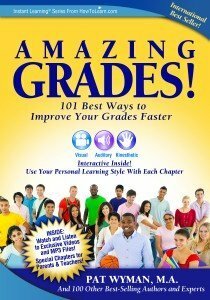 “As a college professor for teachers, I teach them to help their students succeed first, by knowing how to learn using personal learning styles, and then to make certain that students understand they will need to add to their preferred learning style in order to master written tests successfully. “Since written tests are best suited to the visual learner who thinks in pictures, teaching students how to learn more quickly by adding the visual learning style and learning in pictures, will serve them throughout their school and workplace lives,” notes Pat Wyman, college instructor for California State University, East Bay and best-selling author of Instant Learning for Amazing Grades (a 14 day study skills system for students in grades 1-8); Spelling Made Easy; Math Facts Made Easy and Amazing Grades:101 Best Ways to Improve Your Grades Faster which is a worldwide goodwill book for college students with learning strategies in all subject areas. In addition to the three learning styles mentioned about, there are also six learning dimensions which directly affect how a student prefers to understand how to learn and interacts in the classroom : Independent, dependent, competitive, collaborative, participant and avoidant. The Grasha-Riechmann Survey can help you determine your own learning dimension. Most people benefit by having some choice over how they study and learn. Independent learners often prefer to work at their own pace and choose to work alone. If they can figure out a shorter or different way to find an answer, they may ignore guidelines provided for solving problems. Meanwhile, dependent learners prefer following instructions provided and will usually not miss a step. Students who thrive on out-performing other students are competitive learners and want to be the best student in the classroom. Collaborative students work cooperatively with the teacher and other students and this often makes it easier to know how to learn the new material. Students who get involved because they enjoy the class experience are participatory learners. Avoidant learners can be difficult to teach because they prefer to be somewhere else doing something else and are often overwhelmed by the class materials. Hemispheric preferences come into play with right-brain and left-brain learners when they learn how to learn. Left-brain learners prefer logical, detailed and organized instructions. They focus on details to reach a conclusion and make rational decisions. Right-brain learners enjoy thinking outside the box and creativity. They see the big picture and the relationships between people and things and processes and usually solve problems intuitively. Gender differences translate into various how to learn strategies and learning differences too. Girls mature faster than boys and can sit quietly and pay attention at a younger age while boys find it difficult to sit still. Girls are usually more self-critical and willing to accept help from the teacher; and boys are more likely to think they are smarter than they are and resist help. Around Middle School, though, many teachers, according to educational research, begin to show a considerable preference for calling on boys and discounting girls’ classroom participation. This may be due to increasing need for enhancing student engagement related to behavior or many other possible factors. In addition, there are a myriad learning difficulties which contribute to learning differences and they way a person prefers how to learn. Children and adults may have difficulties with reading, spelling and writing, math, memory, paying attention, getting and staying organized and with directions, time and space. The best way to overcome these learning difficulties is by recognizing them in students and presenting the material in multiple ways in order to reach every student. For example, teaching a child how to spell should involve getting a picture of the word in their mind so they can recall how the word looks during a test, having them say the word aloud and using their fingers to trace the word. This way you have taught them how to learn in a way best suited to the way they are tested, while showing them how to learn in their preferred learning style as well. Karen Kay is a writer who is passionate about education and is highly involved in trying to make graduate programs such as the ones at Wagner College in New York accessible to the masses. Karen gets her energy from a nice long run and loves to dive into a good book and interviews experts on using personal learning styles and how to learn.